Our 100% Viognier wine is fermented and settled in neutral oak barrels as well as stainless steel tanks. We marry these two styles of Viognier so that it opens softly yet still has a crisp fruity finish. It has no residual sugar and partial malolactic fermentation.The apricot, pear, and citrus bouquet highlight this refreshing white wine. Currently serving and selling 2015. Innocence is a pleasantly aromatic wine with nicely balanced acidity, achieved by slowly fermenting Traminette grapes at 54°F. This medium-bodied white wine pairs well with delicate and heartier foods. The grapes were grown by Pinehaven Vineyards in Brookneal, VA.
Our Merlot clusters are large, rich and deep in color. We use a light oak during aging to enhance the flavor of a beautiful grape that makes an excellent wine. Currrently serving and selling the 2015. Pairing Suggestions: BBQ, pizza, beet salad or savory salad, chicken, or grilled fish. This is a blend of Merlot (49%) , Malbec (26%) and Petit Verdot (25%) making an elegant, smooth wine with a nice finish. Indulgence is our signature wine. Each year the blend varies depending on the amount and quality of the grapes grown. Our son, Jeremy Ligon is a talented winemaker who contributes to crafting each year's Indulgence blend with his precise palate and winemaking expertise. Tasters enjoy comparing different vintages of the Indulgence and noticing the unique characteristics that change from year to year. We are currently serving and selling our 2015 Indulgence. This is truly a wine with decadent character. We ferment our Petit Verdot with Viognier skins and then add 5% of our Viognier wine prior to bottling. The Viognier allows more floral bouquet also reducing some of the harsh tannins in the Petit Verdot, which makes this an exquisite marriage. We are currently serving and selling the 2015. Envy is an exclusive reserve wine available to our Envy Club members only. This bold wine is made from Hunting Creek's finest Petit Verdot grapes harvested from 12 year-old vines and aged in French Oak for 20 months. Over the next 5-10 years, this lush red wine will continue to soften and exude its full character. Not available for tasting or purchase in the tasting room. See our Wine Club page for more information. 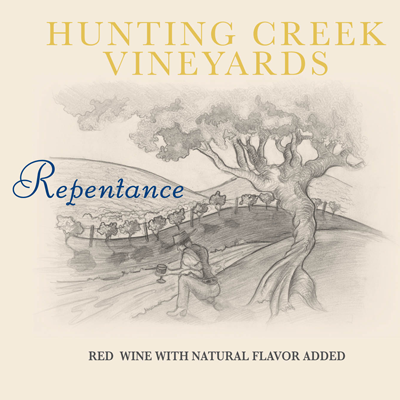 Repentance is a light red wine made from Cabernet Franc and sweetened naturally with Merlot concentrate. This is a semi-dry wine with 1.5% sweetness that could be enjoyed after a meal or by friends that prefer a slightly sweeter wine. Currently serving and selling the 2014 and 2015. Pairing Suggestions: Fruit, cheese cake, sponge cake, and all berry desserts. May be used as a stand alone sangria poured over fruit. This also works well as a pork reduction and used in place of water in chocolate recipes. Seduction is a velvety soft, rich, dessert wine that was aged in bourbon barrels for 20 months. The grapes used to make this wine were grown at Pinehaven Vineyards. Pairs well with coconut, cherry, and peanut butter desserts. We hope Seduction will accompany many of your memorable moments.